* This is my article in BusinessWorld on March 15, 2017. The endless debate in mining is largely fueled by endless myths and disinformation that fan more emotionalism than reason. Below are some of these myths and the realities behind these half-truths. 1. Mining provides a small contribution to GDP, only P70 billion a year in gross value added (GVA). Wrong. Mining GVA is P85 billion a year, average for 2010 to 2016. Also, the sectors gross value production is P166 billion a year, average for 2010 to 2015. 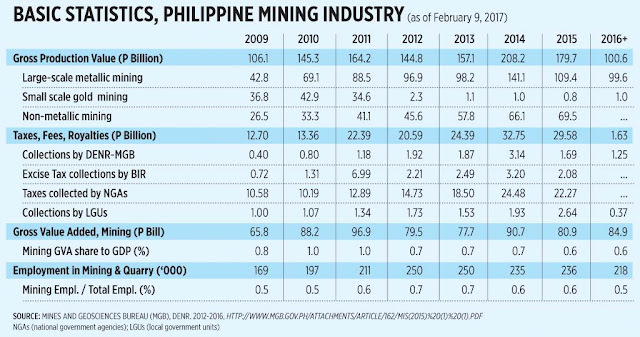 A large part of this is from large-scale corporate mining while the reported contribution of small scale mining is very small, only about P1 billion a year in 2013-2015. 2. 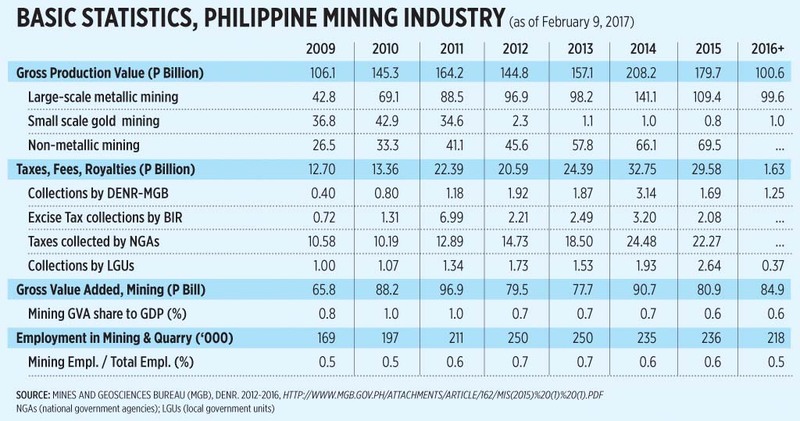 The mining industry’s tax payments are small and almost insignificant at only P3 billion a year. Wrong. Total taxes, fees, and royalties paid by large-scale mining is around P23 billion a year, the P3 billion a year is only for the while the excise tax collections by the BIR. Small scale mining pay zero to the BIR, they pay only little amount to the LGUs. Wrong. From official figures, employment in the sector is about 240,000. Excluded in the numbers are those that are indirectly hired like communities that benefit from several social development and management program (SDMPs). 4. Mining activities should be stopped since it results in large-scale environmental damage while yielding minimum benefits. Wrong. 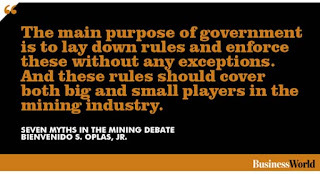 Aside from the national income and consumption taxes (corporate income tax, VAT, excise tax, documentary stamp tax), royalties, and regulatory fees, there are plenty of mandatory contributions and community expenditures that a mining company must spend on. These include: (a) Annual Environmental protection & Enhancement Program (EPEP), (b) SDMP, (c) Community development program (CDP), (d) Environmental work program (EWP), (f) Safety and health program, others. Then there are mandatory environmental funds; (a) Rehabilitation cash fund, (b) Mine monitoring trust fund, (c) Mine waste and tailings fees reserve fund, (d) Final mine rehabilitation and decommissioning fund, (e) Environmental trust fund, (f) Mine rehabilitation fund (MRF), others. 5. Open pit mining is very destructive and must be banned anywere. Wrong. It looks very destructive only in the mining stage. After the minerals are mined out, the area is rehabilitated by covering them with topsoil then reforested. It is happening in Rio Tuba Nickel mining in southern Palawan and other companies. With global cooling to follow the global warming phase, we should expect more rains, more flooding, not less. This means we should have more dams, lakes, and other water-impounding structures to reduce flash flooding during heavy rains. Some mined out open pits are better left as big wide holes and serve as man-made lake, like Caliraya lake in Laguna. These can create new jobs via tourism, fishing and irrigation for farms, aside from reducing flash floods. 6. Closure of many mines means better investment environment because the country is getting more green. Wrong. DENR Secretary Gina Lopez’s suspensions and closure of many firms has negative signals. There are more uncertainties in the sector now as more regulations are added on top of existing ones, each regulation costing money and time to comply with. And these will eventually discourage investments and drive away some of the large companies that want to remain honest. The “small-scale” and illegal mining that are hardly taxed and regulated can flourish in this environment of heavy regulation. 7. Mining is entirely useless and destructive so we should have none of it. The main purpose of government is to lay down rules that apply to all, big and small players, and enforce the laws without any exceptions. 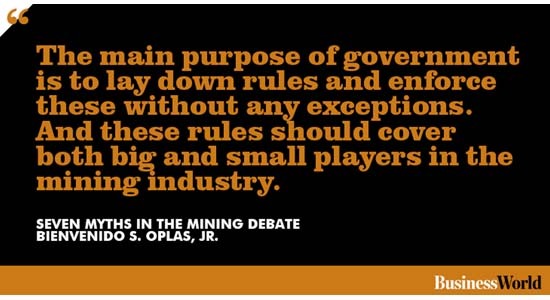 If government should be strict with big mining firms, then it should be strict with small scale mines too. If government is to promote job creation in many sectors, then government should protect jobs in compliant big mining firms too.